External Affairs Minister Sushma Swaraj was on Monday discharged from AIIMS, 10 days after she underwent a kidney transplant at the premier hospital. “Sushma Swaraj has been discharged from hospital at 7 pm after her postoperative uneventful recovery following kidney transplant operation on December 10,” the AIIMS said in a statement. Thanking the team of doctors, nurses and paramedics of AIIMS, Swaraj said the hospital lived up to its reputation. She posted a series of tweets and said she has started looking at official papers, but added doctors have advised her not to receive visitors. “I am grateful to the dedicated team of doctors, senior residents, sisters, technicians and staff of AIIMS. They have lived up to the reputation of AIIMS,” Swaraj tweeted. “I am back from AIIMS after the surgery. I am seeing the necessary official papers. However, I am not allowed to receive visitors,” she said in another tweet. Union Health Minister J P Nadda, who is president of AIIMS, visited Swaraj before her discharge and expressed satisfaction about her recovery. A team of doctors will continue to review Swaraj’s progress over next several weeks, AIIMS Director M C Misra said expressing happiness over her recovery. Swaraj, 64, has been advised to restrict visitors for next three months at home and office to minimise the chances of infection. “A team of specialists, which included transplant surgeons, nephrologist, pulmonologist, endocrinologist reviewed her today for her post discharge advice regarding medications,” the AIIMS said. Nadda also met the team of doctors and nurses who treated Swaraj and congratulated and complimented them for care provided to her. As no suitable donor was available in the immediate family, the transplant was done with the kidney from an unrelated donor and clearance for it was given by the Authorisation Committee of AIIMS. 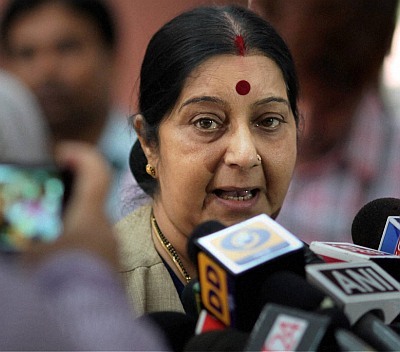 On November 16, Swaraj had tweeted that she was in AIIMS because of kidney failure. Swaraj, who has been in and out of the hospital for last few months, was admitted to AIIMS on November 7. After Swaraj made public her health condition on social media, several people offered their kidneys to her.